A green lawn, red roses, and a white picket fence. Red lipstick, a pink sweater, and beautiful blonde hair. Yellow curtains, a yellow suit, and a roll of yellow police tape. Green, rotting flesh, black, crawling ants, and ribbons and ribbons of blue velvet. The logging town of Lumberton has a secret; a terrible, terrible secret that defies explanations and answers. 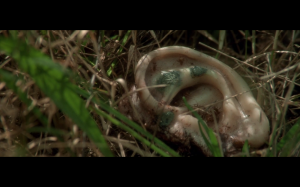 A severed ear is found in a field. Bodies sprawl in back alleys. And somewhere nearby a well-dressed criminal lip-syncs Roy Orbison as another huffs gas and wails for his mommy. The central crime at the heart of David Lynch’s Blue Velvet may eventually be solved, but it is only one facet of a world grown sick and gangrenous. The how’s, what’s, and who’s may be answered, but the why’s elude us. They will always elude us. And all that will remain when the curtain closes is the memory of a mystery; the impossibility of Lynch’s imagery; the enigma of blue velvet. So what are the facts of the case? Jeffrey Beaumont (Kyle MacLachlan), upon returning home from visiting his injured father in the hospital, discovers a human ear in an abandoned lot. He investigates a woman he believes to be involved: nightclub singer Dorothy Vallens (Isabella Rossellini). During an illegal search of her apartment, he witnesses her being savagely beaten, abused, and raped by a psychotic named Frank Booth (Dennis Hopper). To his horror, he learns that Frank is holding her husband and young son hostage in return for sexual favors. Later Dorothy’s husband is discovered dead, sans ear. The police move in, Frank is shot, and the day is saved. But Blue Velvet is not so simple a film. The facts of the case are mere distractions. Here is a film about mood and atmosphere, tone and texture. The opening scene sets the tone for the entire film: a picturesque neighborhood where the sun is shining, waving firefighters roll down the street, and sweet music drifts in the background, bearing witness to an old man having a violent stroke. And in one of the most famous close-ups of the 80s, the camera sinks down into his perfect lawn to find a horde of insects chewing, devouring, screaming. The shrieking dualities of Lumberton can best be observed in Jeffrey’s relationships with women. His girlfriend, Sandy (Laura Dern), wears the kind of plain, unassuming clothing you would expect to see on a Mayberry teeny-bopper fresh from a sock hop. Their flirting seems a little too cute, a little too charming (“You know the chicken walk?”). Shimmering keyboard music underscores their earnest confessions of true love. But the nighttime sees Jeffrey betray Sandy as he is drawn into an intensely sexual, sadomasochistic relationship with Dorothy. Soon they are caught by Frank, and Jeffrey is taken on a nightmarish “joy ride” where he is humiliated and beaten while Dorothy screams in helpless protest. Then the night clears and Jeffrey is back in the world of 1950s sitcoms. 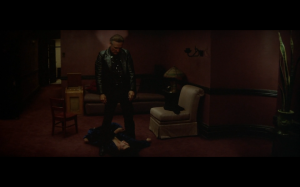 Much has been said about how Blue Velvet is a satire of benign Americana. But I’m not so sure the film is dead-set on reflecting, refracting, and rejecting the American Dream. Yes, the ending seems a bit too perfect and contrived. But consider this: many of Lynch’s films see his protagonists find some measure of peace and fulfillment in the end. Henry Spencer embraces the Lady in the Radiator in Eraserhead (1977). John Merrick finds relief in death in The Elephant Man (1980). Paul Atreides brings rain to Arrakis in Dune (1984). And Sailor comes back to Lula and their child in Wild at Heart (1990). 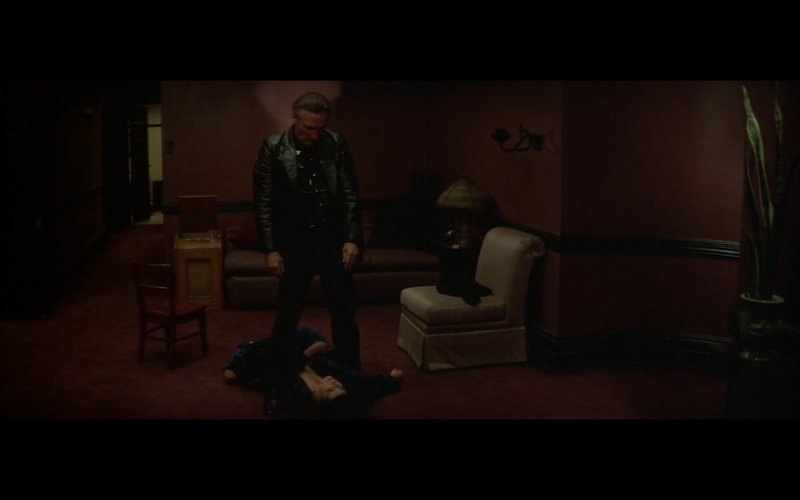 Perhaps the ending of Blue Velvet is precisely what it appears to be: happy. And if that is true, then what does that say about the supposed cynicism within the rest of Blue Velvet? About David Lynch? About the rest of his films? Mysteries beget mysteries beget mysteries. Just when you think you figure Blue Velvet out, a hundred more questions arise.